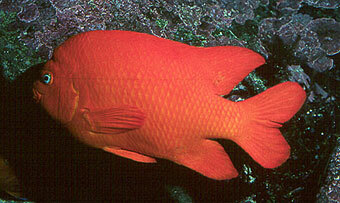 Garibaldi inhabit rocky substrate and kelp forests from Monterey Bay, California, to the southern tip of Baja, Mexico. It is the largest member in its family (Pomacentridae), commonly known as damselfishes, growing to a maximum size of 30 cm. Typical of damselfish behavior, the garibaldi is highly territorial. Spawning begins in April and may continue through October. Males begin preparing nests in March by removing debris (including green and brown algae) from the nest site and carefully grooming the red algae to a length of about one inch. Females select males to spawn with based on the appearance and quality of the nest. After the female has selected a suitable mate and deposited her eggs into the nest, the male is responsible for guarding and caring of the eggs during the 2-3 week incubation period. Garibaldi reach maturity between 3-6 years and may live up to 20 years.Garibaldi produce sounds associated with agonistic behavior. Low frequency “thumping” sounds are produced by grinding of the pharyngeal teeth and are amplified by the swim bladder. Fishes which intrude on a garibaldi’s territory, which may include a nesting or foraging site, are warned with a physical display accompanied by sound.